Ragnarok Online Philippines 2017 Open Beta Test Announced - KABALYERO - PLAY, BLOG & EARN! The Close Beta Test of Ragnarok Online Philippines 2017 started last June 20, 2017 and it lasted for a few days. I was only able to play for a couple of hours because I was more interested in playing in the Open Beta Test of the game. 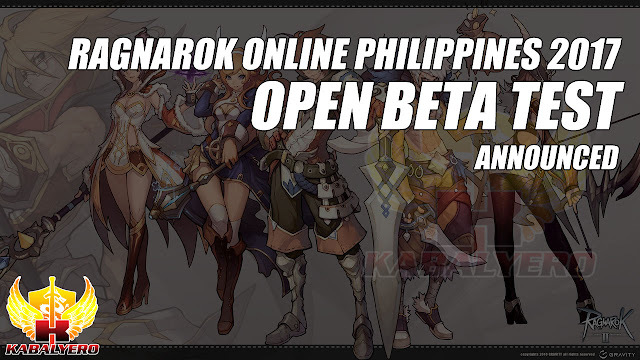 Today, the publisher of Ragnarok Online Philippines 2017 announced in its website the Open Beta Test of the game and it will happen tomorrow, June 29, 2017 at around 3 in the afternoon. This transition from Close Beta Test to Open Beta Test means that everything is WIPED clean. In other words, everyone will start at Level 0 again and that is why I didn't spend a lot of time playing in the Close Beta Test. Ragnarok Online Philippines 2017 is published by Electronics Extreme and if you would like to participate in the Open Beta Test of the game then simply go to ragnarokonline.com.ph, create a new account, download and install the game, wait for the servers to go live on June 29, 2017, login and play.